Skiing on Volcan Lonquimay in late spring conditions, 2016. 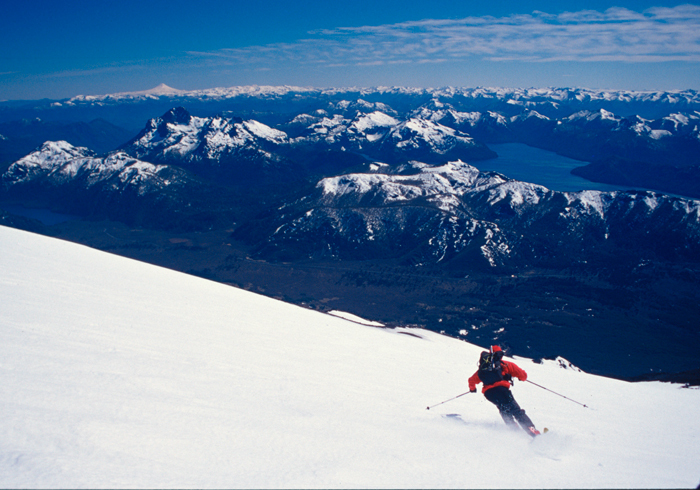 There are several good skiing areas in Chile, from north to south we feature the following on this page. The Andes have some great ski touring and mountaineering terrain, with everything from accessible day trips near downhill resorts to committing expedition skiing on the Patagonian ice-caps. In between these extremes are some very quiet and scenic mountain areas with excellent ski-mountaineering and ski-touring terrain. This page concentrates on the peaks and tours accessible from Chile that we have done in the past. See the Argentine Ski Mountaineering page for details of good ski tours accessible from Argentina. ANDES regularly organise and lead ski mountaineering course in Argentina and Chile, for more details of the trips we are currently offering please see the Calendar page. There is a short chapter on ski-mountaineering and many suitable ascents are also described and pictured in the guidebook by John Biggar - The Andes, A Guide for Climbers. The far north of Chile has limited skiing, but the 6342m high Volcan Parinacota, right up on the Bolivian border, is one of the best descents in the area. There is some great ski-touring just outside of Santiago, at heights of 2500-4000m, good areas around the Tres Valles resorts and the Cajon del Maipo. The following pictures were taken in the area above Santiago in September 2001, when we had brilliant snow conditions and unbelievably good weather. Pulling sledges in to our high camp at Banos Colina.... sledges loaded with wine! One of the best places to go for ski mountaineering in the whole of the Andes are the volcanoes of the Andean Lakes district in southern Chile. 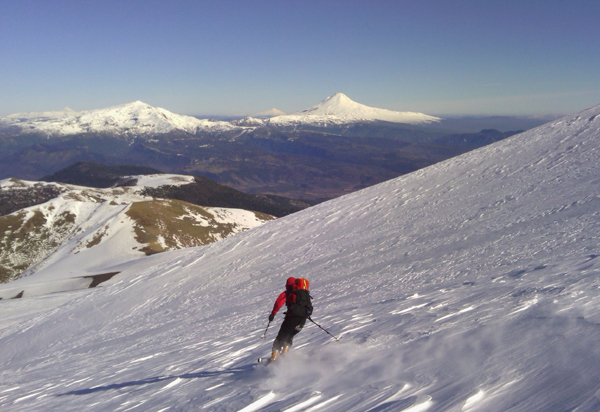 We have skied to the summits of Lonquimay, Antuco, Chillan, Villarrica and Llaima many times in the past. Several other peaks, notably casablanca, Sierra Nevada, Lanin and Choshuenco also make good ascents. A little bit further north, the peaks of Chillan Nuevo and the Nevados de Chillan Viejo are also often in good condition. 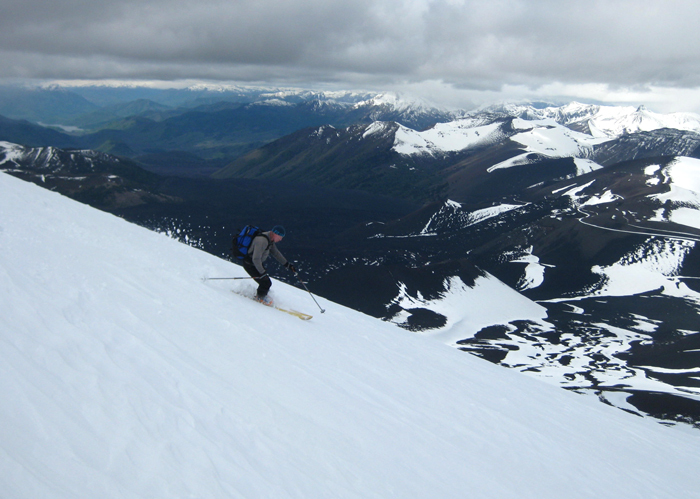 Skiing Volcan Lanin, Chile-Argentina border. Snowboard Mountaineering on Volcan Villarrica, Chile, August 2007. Skiing on Volcan Casablanca, Chile, October 2016. Further south in the area known as Patagonia there is more good skiing, and the season can be a bit later, September through to November. David Roberts skiing a cornice above the Ibañez valley, Chilean Patagonia. 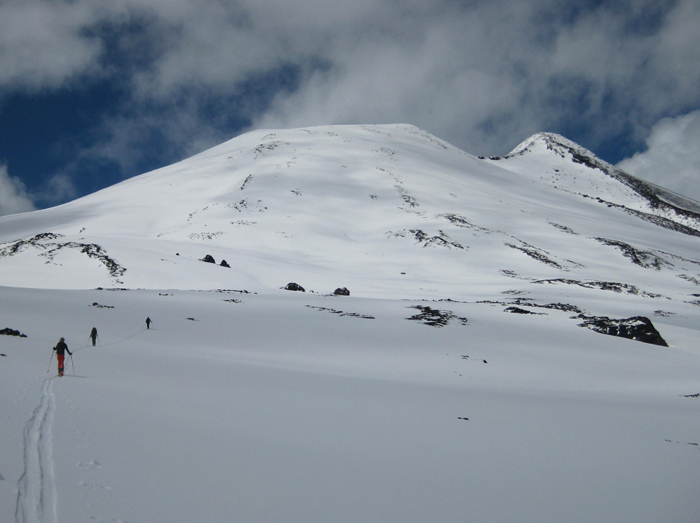 ......and skiing down the peak of Glaciar Alto in the remote San Lorenzo group. Setting off on skis from high camp for the summit of San Lorenzo, Chile. The Patagonian ice-caps provide some superb skiing terrain, though the weather is not always good. We ran our first trip there in January 2000 and go back every few years. Skinning up towards Gorra Blanca form Paso Marconi on the South Patagonian ice-cap, accessed from Chalten in Argentina although the mountain itself is partly in Chile. Our last scheduled expedition to the ice-cap ran in November 2011. For more information on this expedition or to see more photos of the Patagonian Ice-cap please go to our Patagonian Ice-cap page.